When you start exploring New York’s 469 square miles of concrete jungle, the only thing you will need is stamina… and money. Because as far as attractions go, there are more things to see and do than you possibly could in a whole lifetime. I wonder if even born-and-raised New Yorkers know their city inside out. But this doesn’t mean you cannot get the quintessence of the Big Apple in one trip. Next time you explore, here are seven unique things you can only -and should- do in NYC. Funny how, when people talk about museums, they first think about DC. The fact is that New York has the biggest museums in the world, be it in fame or scope. Hollywood often films its greatest productions in NYC. The Guggenheim’s building itself is a design masterpieces designated as one of the greatest architectural works of the last century. As for the MET, it is among the top 10 biggest museums in the world. But what makes New York City’s museum scene so interesting is that it is possible to visit nine of its finest cultural institutions in less than a mile. The stroll down 5th Avenue goes from 82nd to 104th Streets, past The Metropolitan Museum of Art, the Goethe Institut, the Smithsonian, and the Guggenheim. You can visit all nine museums for free, once a year, on the second Tuesday of June. For the Annual Museum Mile Festival, cars make place on the streets for museum attendees and all sorts of street entertainment. You cannot visit NYC without feasting on a New York-style pizza; that would be wrong. A while ago, on this blog, we rounded up 5 of the best pizzerias in town. From the original Patsy’s in East Harlem to the eccentric Koronet Jumbo pizza slices, there’s a pie for every taste. Every true foodie also knows the other foods associated with New York. For instance, it’d be hard not to be tempted by their sauerkraut hot dogs, complete with relish, onion, and mustard. And while you are at it, add the bagel and the baked pretzel to your list of culinary exploration. Many cities around the world pride themselves of being bike-friendly. Montreal is building a reputation around its public bicycle sharing system. Amsterdam is renowned for its yellow bikes; they are an institution and one of the best ways to explore the city. New York, too, has a biking tradition… although many wished it didn’t. There are thousands of bikes available in hundreds of stations throughout the city which makes them convenient and eco-friendly. If riding the subway is a New York thing, riding a bike should also be part of the must-have experience. 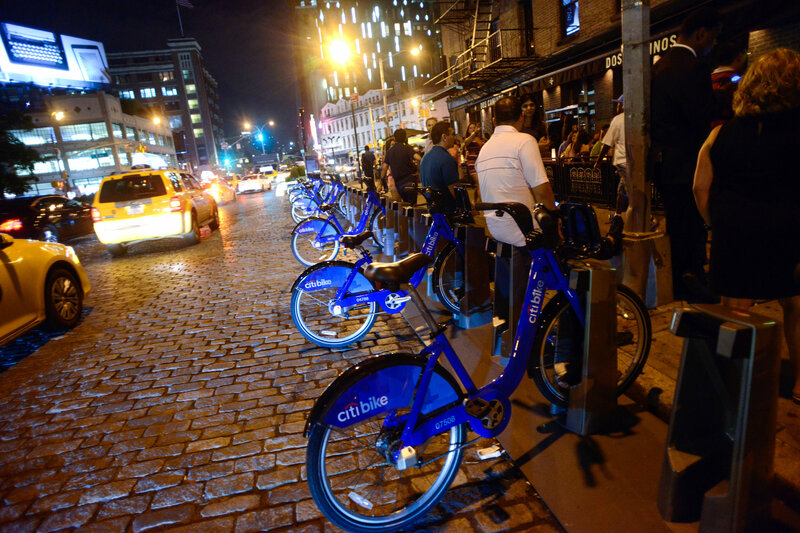 Renting a Citibike is a nice, slow-paced way to visit. And as long as you don’t go slaloming between cars and follow simple rules, you will safely get anywhere you want to go in the metro area. From green spaces to architectural marvels to pop culture icons, everyone has a reason to sing “New York, New York”. NYC’s skyscrapers are among the most iconic in the world. Hard not to see the Empire State, the Chrysler, or the GE buildings, even if you wanted to. Plus, they make excellent vantage points to view the cityscape, especially the top of the Statue of Liberty and the Empire State Building. In all that, we tend to forget that the heart of this city is a 1.3 square-mile-large urban park. Central Park and the New York Botanical Garden are definitive rally point for nature lovers. They both offer top-class entertainment and “exhibits” all year round. Even if you are not the biggest sports buff, the name of the Yankees will inspire respect if not fear in you. In New York, their stadium is an institution; a museum dedicated to the best, record-breaking moments of the ball game. The old Yankee Stadium was called “The House That Ruth Built” in tribute to Babe Ruth, probably the greatest to ever play the game. It also went by the monikers of “The Cathedral of Baseball” or humbly “The Stadium”. Above all, it was a place that witnessed many historical events; from perfect games to boxing games to papal masses. While the original stadium closed down, the new stadium incorporates elements of its now-demolished predecessor, including the Monument Park. Go relive the great memories that made the Yankees the greatest sports team in American history. If you are looking for the most awesome watering holes in New York City then you will want to visit the Lower East Side. The area is known for its profusion of bars, clubs, and lounges, perfect for groups and all budgets. Except for upscale venues such as Beauty and Essex or the Box cabaret, no need for reservations. I was told the ultimate bar crawl on the Lower East Side should go from Loreley’s to Lil Frankie’s, past Epstein’s Bar, the Watermark and everything in between. Agreed? Who is Dan Smith? Just an authentic New York legend who “will teach you guitar”. Regardless of how good you are with the instrument, Dan Smith promises to “open up a world of possibilities for your guitar playing”. So what are you waiting for? Seek out the man… or at least grab one of his flyers.